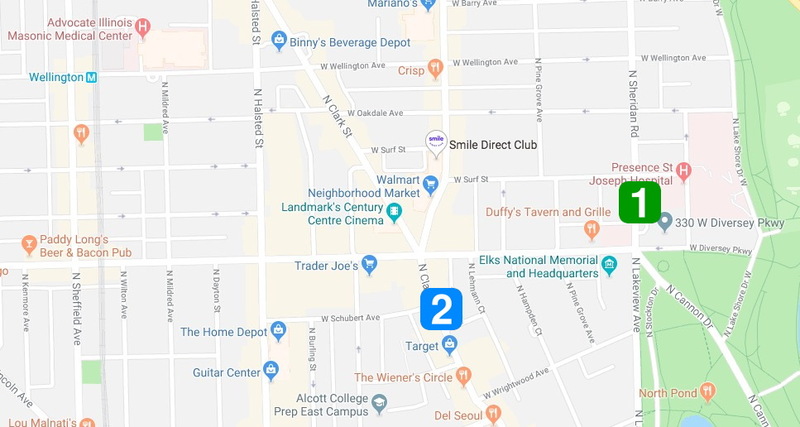 Approximate locations of the two robberies. Chicago police issued a community alert late last night to warn about two recent daytime robberies in southeast Lakeview. The warning comes after two more robberies were reported in the nearby Wrigleyville neighborhood on Saturday. In both cases mentioned in the alert, two offenders battered people on the street and stole the victims’ phones before running away, police said. One incident was reported in the 2800 block of North Sheridan at 11:40 a.m. on March 30th. The second robbery was reported in the 2700 block of North Clark at 10:10 a.m. on April 7th. Neither case was dispatched to police officers for an immediate response, which indicates that either the victims reported the incidents to police well after the crimes occurred or police dispatchers chose to route the victims’ calls to a desk officer. Detectives said the offenders are two black men between 18- and 21-years-old. One of them is about 5’5” tall and weighs about 125 pounds. No further information was available for the second man. Anyone with information about these incidents may contact Area North detectives at 312-744-8263 regarding pattern #P19-N-103.